D.D. Bullwinkel”s Outdoors, founded in 1994, is a specialty outdoor retailer (outfitter) in Brevard, North Carolina. As a locally owned, independent shop our mission is to bring you the best gear in the industry and the knowledge to use it, affordable prices, value and exceptional service. We specialize in outdoor apparel and gear for hiking and camping; backpacking and climbing, exploring and travel. We are committed to a personalized retail experience and encourage you to come in our store, try on, get fitted, compare and contrast, touch and feel our products and interact with our staff who know and go outdoors. Located on Main Street, we are minutes from one hundred thousand acres of pristine forests brimming with epic hiking and mountain biking trails. Dee Dee and her friend Cindy Bullwinkel, start researching what businesses are missing in the mix in Brevard and start researching 3 different potential business opportunities. After ruling out two of the three ideas; Dee Dee writes a business plan for a gift shop specializing in NC products. As they struggle with finding a name, their church secretary chimes in, suggesting the perfect and logical name: D.D. Bullwinkel’s. A blend of Dee Dee’s first name, and Cindy’s last name. With Varner’s Drugstore’s imminent closing on the horizon, they find the perfect location for the venture, on S. Broad Street. The first bank they pitch says ‘yes’ to a small business loan. D.D. Bullwinkel’s “A Carolina Marketplace” opens in June 1994. 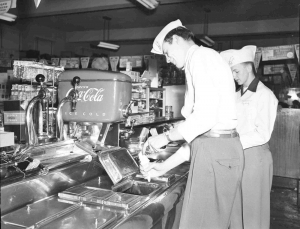 The owner of Varner’s lunch counter, decides to close that business, and the Perkins’ and Bullwinkels’ spend 6 months renovating the building and open Rocky’s Grill and Soda Shop in June, next door to D.D. Bullwinkel’s. Their vision of an ‘ice cream shop that sells some sandwiches’ morphs into a ‘restaurant that sells some ice cream’. 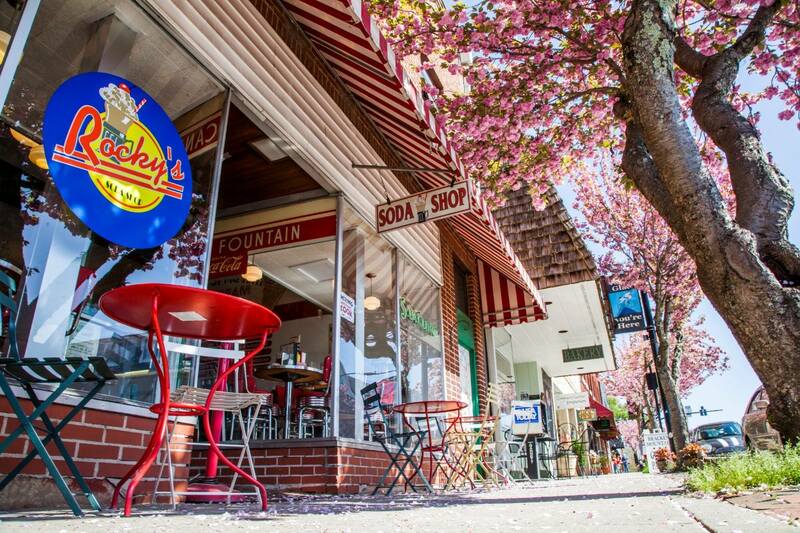 It’s destined to become the iconic vintage Soda Fountain on Main Street known for its homemade grilled pimento cheese sandwiches; hotdogs and best buns; and handspun milkshakes. The Perkins’ buy out the Bullwinkel’s interest in the business, and take the business in a new direction, adding apparel and accessories to transform D.D. Bullwinkel’s into a lifestyle, general store and gift store. Dee Dee opens a women’s boutique clothing store on W. Main Street in Brevard, called D2’s Clothing Company. Dee Dee sells D2’s Clothing Company to an employee. October, ’06 the Perkins’ open Moose Tracks Shoe Store on W. Jordan Street, specializing in comfort footwear, travel wear and accessories. D.D. 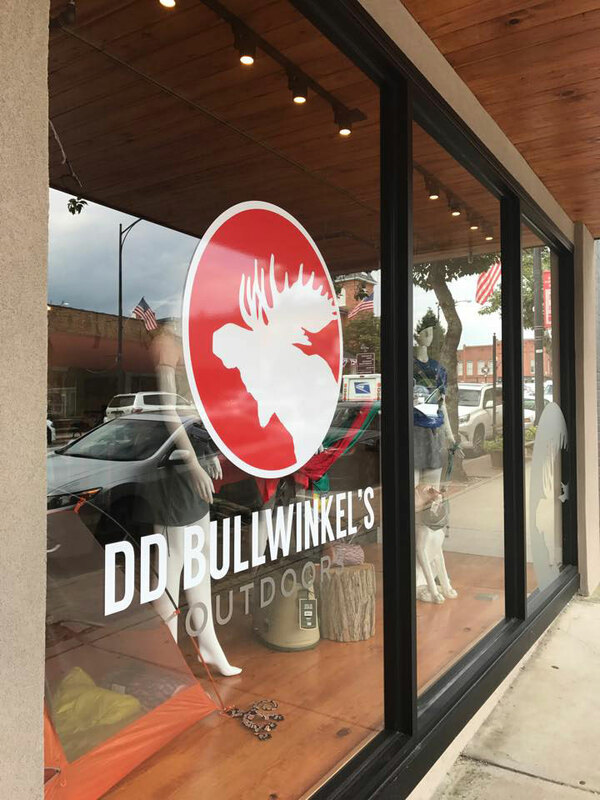 Bullwinkel’s begins transitioning from a general store and gift store, into an outdoor lifestyle store adding more outdoor apparel and light gear. And make a concerted decision to work its image and rebrand the store as an outdoor store. The Perkins begin looking at the idea of finding a new location in downtown Brevard to expand, and open their vision of a full service outdoor retail store. After a long and diligent search, the Perkins’ put in an offer on the former Belk Department store building on E. Main Street. Perkins’ apply for a Federal Grant through the NC Commerce Department. We are awarded the grant, and begin the long process of designing renovating and repurposing the 1940’s era building . They rebuild and modernize the building and launch their new brands, D.D. 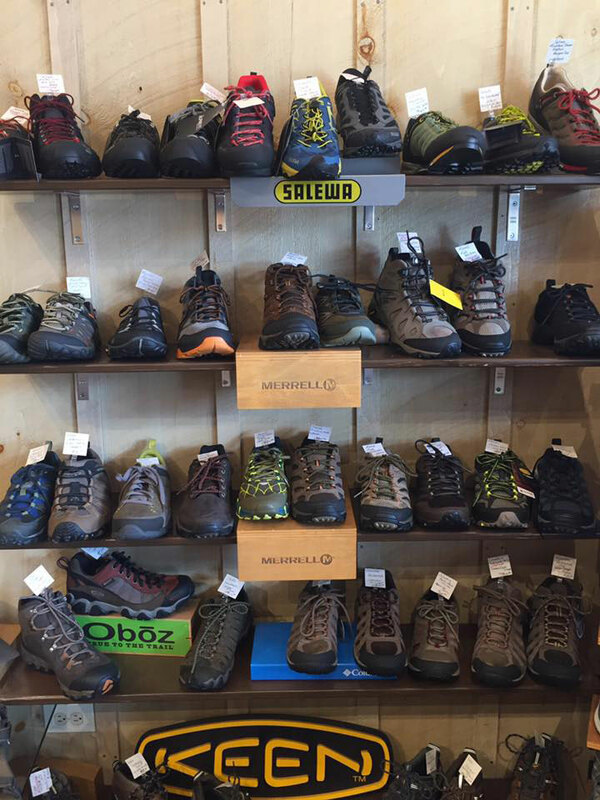 Bullwinkel’s Outdoors and Moose Tracks Footwear. Our D.D. Bullwinkel’s staff are incredibly knowledgeable about the equipment we offer, and equally knowledgeable of our beautiful backyard here in Western North Carolina. Bring us your questions whether its gear or trail related, and we can point you in the right direction.